What are the minimum PC requirements to avail of Virgin Media's supersonic 360Mb broadband service? While most computers can avail of our service, there are some minimum requirements to receive the highest speeds with our supersonic 360Mb Broadband service. If my PC doesn't meet these minimum requirements does that mean I can't avail of the service? You can receive our 360Mb Broadband service on most operating systems once the PC has an Ethernet connection or a wireless connection. However, if you don't have such a computer configuration you simply may not be able to reach the full speed. How can I tell what Processor & Memory my PC has? If you're not sure what type of Processor or Memory you have, check the documentation that came with your computer. What is a Network Interface Controller? This is the computer component that sets the maximum speed of your connection when you use an Ethernet cable to make a wired connection between your modem and your computer or other device. Although all Ethernet ports look the same and use the same type of cable to connect, computers have different NIC specifications that allow them to work up to different maximum speeds. 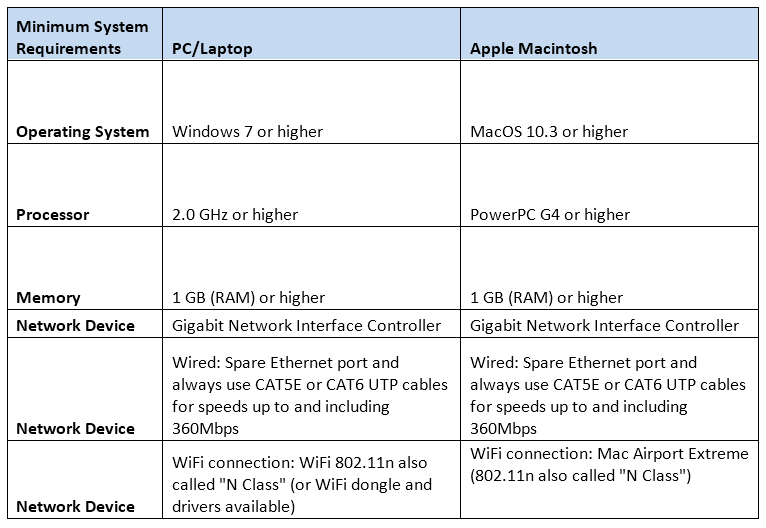 Newer Windows computers and Apple Macs are likely to have a Gigabit Ethernet (also known as a 1Gb or GigE) card, whereas older computers may have 100Mb Ethernet. To get the most from your 360Mb broadband connection, you need to have Gigabit Ethernet as it allows the broadband connection to run at its full speed. How can I tell if I have a NIC with at least 1Gigabit? If you're not sure what type of network card you have, please check the documentation that came with your computer. Although it's great that we can all access the internet without being plugged into the modem, sometimes we all expect a little too much from this technology. A good point to remember is your wireless router should ideally be in your line of sight to get the best speeds possible. The more walls and distance you put between your PC and the router, the slower the speeds you will achieve. To enjoy the best speeds we always recommend you connect to your modem using a cable. But we recognise that in busy homes with everyone online at the same time using various wireless devices that that isn't always possible. When connecting your PC or laptop to the network wirelessly it is important that you use equipment that supports the wireless 'N' standard to get the most from your connection. All modems supplied to Virgin Media customers with speeds of 50Mbps or higher, are compatible with the wireless 'N' standard. Read more for further hints and tips on how to improve your broadband speed.